This dainty tea-cosy is extremely easy to knit and the soft loops give a delightfully fluffy effect. 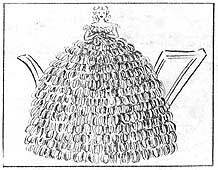 The wool is used double, to make two loops at once. The original was worked with one ball each of green and orange. Two Old UK Size No. 8 knitting needles. 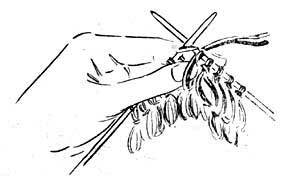 Using the wool double, insert the needle as for plain and knit one stitch, keep it on the right-hand needle, but do not slip the stitch off the left-hand needle; pass the wool to the front (as for purl) and hold under thumb (as illustration shows), then back between the needles; knit into the same stitch and slip off; pass the first stitch over the second. Cast on 36 stitches and knit one row into the back of the stitches to obtain a firm, even edge. Then knit plain for 6 rows. 1st Row: Work throughout in loop stitch, as previously described. 2nd Row: Purl to end. Repeat these 2 rows for four times more. 12th Row: Purl, purling together every 5th and 6th stitch, throughout row. Repeat these 2 rows twice more. Cast off. Work another side to correspond. Sew up the sides, leaving openings for spout and handle. Sew the top to the waist of the bust or doll, and trim the shoulders with a row of tiny loops, if desired.